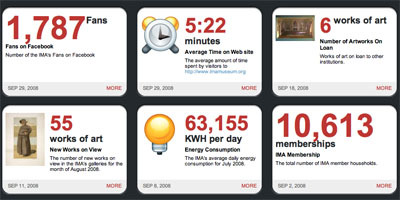 An online information dashboard for the Indianopolis Museum of Art, which attempts to measure & visualize various aspects of the museum's performance. The goal of this dashboard is to seek to quantify & report out on areas of activity of general interest to museum observers & to particular interest to museum studies specialists, colleagues & patrons. tracked data attributes include "Fans on Facebook", "KWh per Day Energy Consumption" & "Number of Art Works on Loan". Sleep disorders are very common in modern society. Mild forms are familiar to everyone and up to 10 – 20 per cent of adults suffer from related diseases (organic sleep disorders). Diagnosing sleep disorders often requires extensive and expensive sleep recording at a sleep laboratory. At the moment, there are hardly any good screening methods for detecting sleep disorders. Research conducted in two Finnish universities, Tampere University of Technology and the University of Helsinki, resulted in the development of a brand-new technology for screening and even diagnosing sleep disorders. The first application of the new technology, a smart alarm clock for mobile phones, HappyWakeUp®, is now available. It is the first health-promoting mobile phone application in the world. In Tampere University of Technology MSc Väinö Virtanen started to record and analyse snoring two years ago to develop a simple screening method. "Very soon we noticed that a common microphone is very sensitive to any sounds and voices produced by movements in the bed during night-time. Everyone has heard the typical voices, when a mobile phone has accidentally called you from someone's pocket", says sleep specialist Tapani Salmi, MD, PhD. Based on the new technology, the sleep research group developed the smart alarm clock for mobile phones called HappyWakeUp. The smart alarm clock gives an alarm signal in the morning just before the ultimate alarm time, if the sleeping subject is awake or "almost awake" due to the natural sleep rhythms. During these moments, the body and brain are already awake and waking up is natural and easy "It is rather an arousal clock than an alarm clock", says Salmi. The alarm time is set normally with the mobile phone. The mobile phone is located beneath the pillow or the bed linen or near the sleeping subject. The appropriate almost-awake moments are detected by using a microphone and statistical analysis of voices. During the last 20 minutes before the ultimate alarm time, the analysis is activated to give a soft alarm signal, if there are movements indicating that the sleeping subject is awake or "almost awake". If the subject is sleeping calmly, no alarm signal is given before the ultimate alarm time. "The alarm signal during deep sleep is stressful and familiar to everyone, but with the smart alarm clock this is avoided. After a trial period of some days or a week, you start to notice the benefits", promises Salmi. The continuous use of the clock helps the internal clock in your brain learn the proper sleep rhythms. "Pleasant mornings help avoid stress in your body and brain. Elevated stress-levels are associated with several risk factors and even diseases, such as hypertension and problems with the heart and brain. HappyWakeUp is not a medical product or treatment to any disease. "In case of sleep-associated diseases and symptoms you should contact your doctor", says Salmi. HappyWakeUp® is available for Nokia smart phones based on S60 3rd ed FP1 platform at www.happywakeup.com. A one-week trial period costs €2. A two-month trial period and a permanent license are also available. The sensitive microphone recording could also be used in monitoring other aspects of sleep. The detection of restless sleep, leg movements associated with the restless legs syndrome and screening for snoring and sleep apnea are possible by employing the same technology. The technology makes it possible to perform several repeated all-night recordings and to diagnose sleep disorders in countries and areas with no previous sleep recording facilities. The new technology is extremely cost-efficient, compared to the use of existing special medical recording devices. The company Smart Valley Software Ltd. is developing the technology into a commercial product, supported by the Finnish Invention Foundation and the Finnish Funding Agency for Technology and Innovation (Tekes) in patent applications. Dr. Salmi is the author of more than 30 scientific papers and book chapters in sleep medicine. Registered Trade Marks: HappyWakeUp®, ArousalClock®. Patents pending 2006 - 2008. Could every morning be equally pleasant? Santé, wellness &/or wellbeing & smart phone: une nouvelle "niche business". Mais aussi peut-être une nouvelle manière d'organiser son temps (gestion d'agenda? ), basée sur des rythmes biologiques repérables, "monitorables" par le téléphone (on pourrait penser aussi à l'accéléromètre, le gps, év. des capteurs non encore présents dans la téléphone, etc.)? By writers, Bernardo A. Huberman, Daniel M. Romero and Fang Wu, a paper analyzing Youtube views to demonstrate how attention and productivity work with crowdsourcing. We show through an analysis of a massive data set from YouTube that the productivity exhibited in crowdsourcing exhibits a strong positive dependence on attention, measured by the number of downloads. In a MMO created to forecast the future of our planet, the SuperStruct game focuses on analyzing the problems of the future and solving them. Created by The Institute for the Future (IFTF), this is more than just a game that allows for speculation of the future but actively seeks to work on the problems we might face and how to keep them from destroying our planet. Watch the five videos detailing the super threats and read the Global Extinction Awareness System report before you get started, but it looks to be a lot of fun while using creative thinking skills. For years, as the price of wireless voice calls plummeted, mobile-phone service providers longed for the day when consumers en masse would use their handsets for more than sending calls and the occasional text message. The industry is finally getting what it wished for. Use of mobile e-mail, browsing, and downloads is on the rise as Americans snap up smartphones like the Apple iPhone 3G. An average owner of the new iPhone uses three times more data than a holder of even an older iPhone version, according to AT&T (T). And the phenomenon is much larger than Apple. People are buying Research In Motion’s (RIMM) BlackBerry devices, snapping up special cards that connect laptops to the mobile Web, and purchasing specialized mobile data-only devices like the Kindle, an e-reader from Amazon (AMZN) that wirelessly downloads books. In the 12 months through June 2008, the number of Americans who had access to media-rich social networking sites via a mobile phone rose 93%, according to a survey of more than 30,500 U.S. consumers by research firm comScore (SCOR). About 58% more people sent photos with a phone than in the year before, and the number of Americans with an unlimited data plan rose 58%. “We’ve seen a significant acceleration [in data use] in the past year,” says Mark Donovan, a comScore senior analyst. . . .